STAINMASTER® Carpeting it is the most trusted name in carpet in America! Find the best carpeting for your house. One that prevents stains and static and looks great for years. Look no further than STAINMASTER® Carpeting it is the most trusted name in carpet in America! Type of material – STAINMASTER® nylon carpet uses a revolutionary fiber called nylon 6,6. Its tighter molecular structure of nylon makes it more difficult for stains to penetrate the fiber. Eliminates static – STAINMASTER® nylon 6,6 carpets contain a number of anti-static fibers. These fibers have a carbon fiber that runs through the center, and acts like a lightning rod to disperse static electricity. Soil and stain protection– STAINMASTER® carpet fiber and STAINMASTER® stain and soil technologies are designed to work best together as one structure. STAINMASTER® stain and soil protection never has to be reapplied. Stand the test of time – STAINMASTER® carpet was introduced in 1986. For more than 30 years STAINMASTER® carpet has been the most trusted carpet brand in the U.S.
STAINMASTER® carpets come in all types of construction and in over a thousand colors and styles. 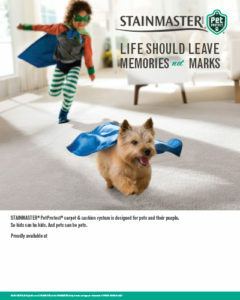 STAINMASTER® carpets are designed to meet a wide range of user needs including families, pets, and special needs such as fighting dust and allergens. STAINMASTER® nylon carpets use a supreme fiber called nylon 6,6 which makes them stronger, stain resistant and extremely durable. STAINMASTER® carpet stain protection never needs to be reapplied. If you are looking for exceptional customer service and the best deals on carpet in the “Denver Metro” area we are the company for you. Give us a call to schedule a meeting at our Denver showroom located close to 8th avenue and I-25 or for an in home estimate with our mobile showroom. We will be able to give you a cost for installation after examining the areas you want your carpet installed. STAINMASTER® Active Family® carpet is one of the most durable long lasting carpets on the market today. Manufactured with high-quality materials and built to demanding performance specifications, STAINMASTER® Active Family® carpet is extremely durable and easy to clean. The properties of the carpet help it maintain its appearance while giving it a nice soft feel. Pick what you want from our wide selection of styles and colors and rest easy knowing Active Family® is durable enough to stand up to your active lifestyle. Active Family®carpet resists food and beverage stains. It is designed to prevent carpet stains with stain-resistant nylon. Spills should not become permanent stains if the spill is treated right away.